Cape May and the surrounding southern NJ coast, offer some of the best Striped Bass Fishing in the world. The surf, Cape May rips and Delaware Bay, as well as the inlets, bridges and back bay waters all hold stripers year round. 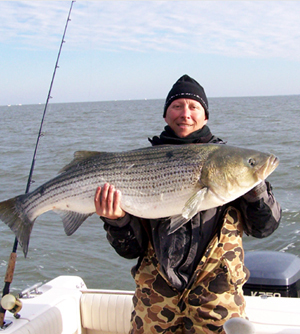 Some of the best Striped Bass Fishing in Cape May occurs in the Fall. The Fall run of Stripers is awesome here in Cape May, NJ. 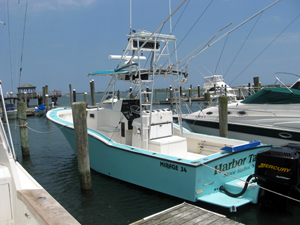 OU operates three different sized boats allowing us to customize the perfect Striped Bass Charter. 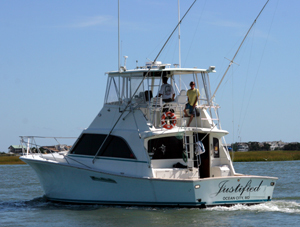 We offer Fly- Fishing and Back Bay Striper Trips on our 19’ Flats Skiff and have both a 34’ Center Console and 48’ Sportfish for fishing the Rips, Ocean, and Delaware Bay. We offer 5, and 8 hour striper trips that are available both day and night. Let us know what you’d like to do and it’s likely we have just the boat for the job. 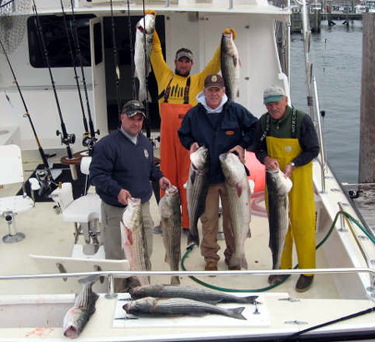 Check out our NJ Striped Bass Charter Boats for the right boat for your group or family. Fall Striped Bass Season - Dates still Available, CALL ASAP!! We will begin our Fall Cape May Striped Bass season on October 27th this season and fish right through Thanksgiving. 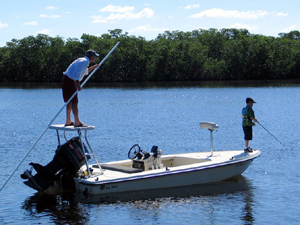 We are keeping the boat as close to the best action as possible to maximize your fishing time. The majority of our Fall Striped Bass Trips are 5 hours, but we also offer an 8 hour trip. We spend most of our time in the Delaware Bay, anchored up and chunking for the BIG ONES! If the Bay is slow, we will move down into the Cape May Rips with live spot, eels, and bucketails. We provide all the striped bass fishing gear, no need to bring anything, but if you have a striper setup you prefer, feel free to bring it. This season we are again docked at South Jersey Marina, right in the heart of Cape May. 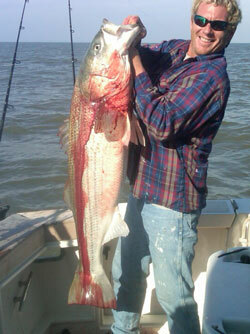 Last Fall we boated three Striped Bass over 50 pounds and may others in the 40 pound range! Hopefully this year, we will see as many big fish. We use Penn 16's, 30 GLDII, 9500 Spinning tackle on your Cape May Striper Charter. The fish range from small 5 pound Striped Bass, up to 50# monsters!